Who says you can’t have a three course meal at the cafeteria? In this dessert, the assertive flavors of balsamic and honey are smoothed out by bright notes of vanilla and the warm crunch of pepitas. Read the rest of the menu here. Dispense vanilla soft serve on a bowl filled with ice. Carefully dodge people holding trays as you speed-walk to the salad bar dressings. Working quickly so ice cream doesn’t melt, drizzle honey over soft serve and add a splash of balsamic vinegar. 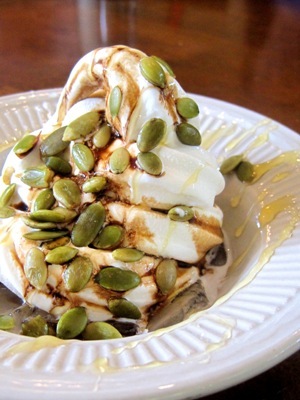 Shake some pepitas over ice cream. In ingredients, I think you accidentally wrote “ice” instead of “ice cream”–love the idea though! Thanks Joanna! Actually it is meant to say “ice” – it’s a little trick to keep the soft serve from melting when it sits in the bowl, and adds a nice frosty touch to the presentation! Daily I get up and appearance through the Forbes list of the richest us citizens. If I’m not really there, The year progresses to function.